Peeps walk like aristocracy from the bath to the boudoir with a luxurious Personalised Bath Robe Coral Fleece Shawl Colours. 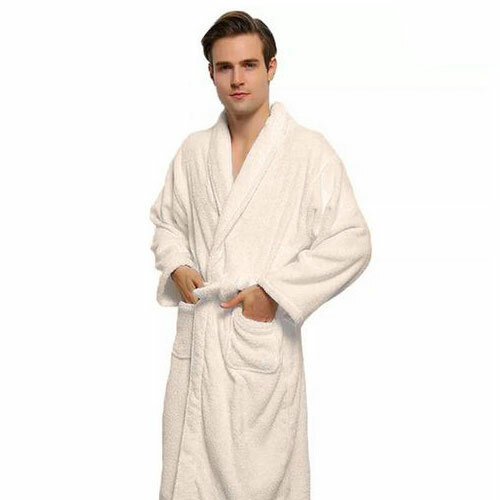 These plush, soft and warm robes lets you sumptuously swaddle yourself, reducing time spent shivering after showers, baths and impromptu bouts of late night streaking. An elegant design makes this versatile vestment suitable for every member of the family. The Personalised Bath Robe Coral Fleece Shawl Colours is completely machine-washable, ensuring that a clean, fluffy robe is never more than a quick cycle away. Every taste and trend is accounted for. Keep your precious ones warm this winter in this super soft and luxurious Personalised Kiddies Gowns. This personalised baby gown has a lovely shawl collar and have a trendy look about them. Personalised Kiddies Gowns are made with high quality soft 300 gsm coral fleece to protect your baby from a chill. The Personalised White Towelling Gowns are a classic favourite for many of our customers. They look great when personalised with your name. Our Products are expertly embroidered to add the personal touch, making it a per gift. These personalised towelling robes have deep pockets, shawl collar and a belt in the same material. They absorb water so are perfect when you have just stepped out the bath or shower.